One would think it’d be easy to find Neverland. 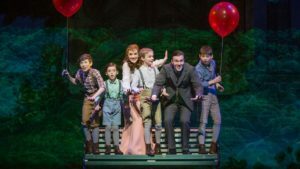 After all, Peter Pan tells us how to in the very first scene of his classic story: “Second star to the right and straight on ’till morning.” This new touring production of “Finding Neverland – The Musical”, however, still has some searching to do. “Finding Neverland” is based upon the 2004 film of the same which in turn is based upon the 1998 stage play, “The Man Who Was Peter Pan” by Allan Knee. It tells the story of distinguished playwright J.M. Barrie and his relationship with widowed mother Sylvia Llewelyn Davies and her four sons, George, Jack, Michael, and Peter. Peter is a troubled boy, grieving over the recent loss of his father. Barrie, having lost his older brother when he was Peter’s age, identifies with the boy and encourages him to take up writing. Meanwhile, Barrie himself begins to write his own play about his afternoon “adventures” with the boys. These “adventures” include voyaging the seven seas with a pirate crew, encountering a Native American tribe, and learning to fly. The play in question, titled “Peter Pan”, doesn’t sit well with stingy producer Charles Frohman, who believes adult audiences won’t identify with the material. The rest, of course, is history. The new cast of Finding Neverland. Rounding out the talented cast is Billy Harrigan Tighe as Barrie, Christine Dwyer as Sylvia, and Tom Hewitt as Charles Frohman who also doubles as Barrie’s dark alter ego, Captain James Hook. The four children are played with incredible charm and wit by Ben Krieger (Peter), Finn Faulconer (George), Mitchell Wray (Jack), and Jordan Cole (Michael). The cast is impeccable and they all command the stage with their powerhouse voices, but I felt that most of the story’s magic was lost in the less than stellar songs by Gary Barlow and Eliot Kennedy. This is not to say I didn’t like every number. There are some incredible emotional ballads in Act II and a tremendous closer to Act I, but the majority of the first act falls victim to sub par melodies and mediocre storytelling. It’s as though they slowed down the first 20 minutes of the film and told it over the course of an hour. All while cutting most the scenes with Barrie and the children. Two patrons sitting next to me left at intermission, however, the powerful Act I Finale encourage me to stay for the remainder of the show. The number in question, “Stronger”, features Barrie battling with his inner demons, manifested into the forms of Captain James Hook and his pirate crew. Barrie vows to fight hard to find the story he so desperately longs to tell, all while sailing aboard Hook’s ship on a dark and stormy night. The musical’s second act picks up and helps further develop the relationship between Barrie and the children, as well as Barrie and Sylvia. While the two merely had a platonic relationship in the film, a more romantic relationship is explored in the musical. While it does provide more dramtatic effect, I felt this addition was unnecessary and historically inaccurate. Still, the musical provides a beautiful combination, of lighting costumes and scenery bound together with wonderful performances that warrant a recommendation from yours truly.